Bridal Shower Games and activities should be fun and interesting but should also be related to bride or wedding in some way. 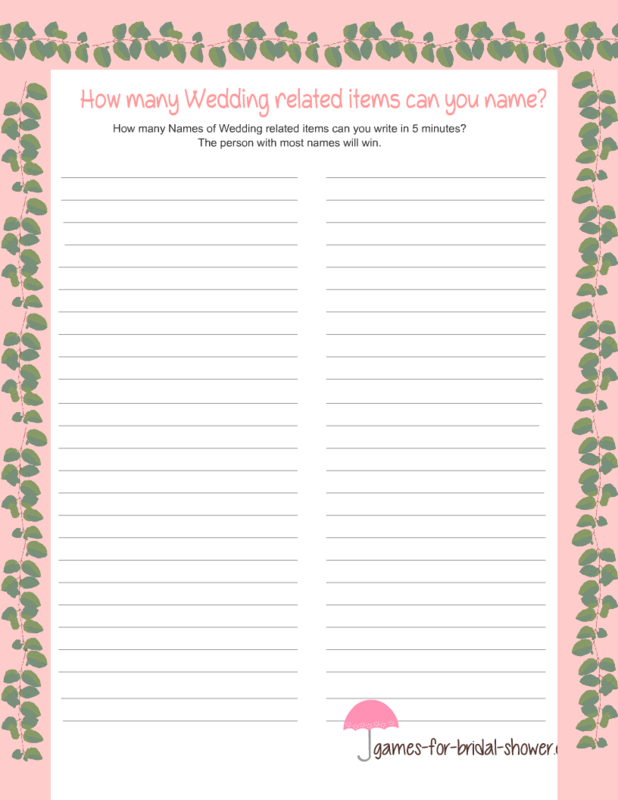 I have prepared this free printable game which is 'name wedding related items'. You can print it on cardstock or ordinary printing paper using your home printer. You can also print these games using your black and white printer but color will be more fun. 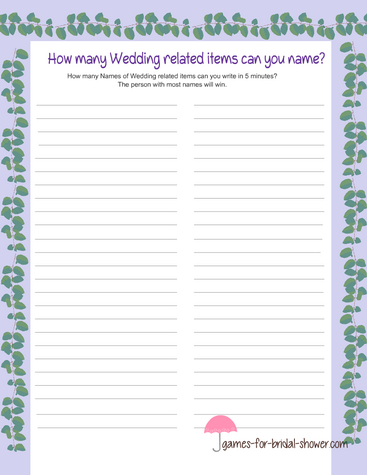 How to Play: Distribute 'Name Wedding Related Items' Game Cards among your party guests with a pen. Take a stop watch and ask the guests to write as many wedding related words as they can within five minutes. The guest with most relevant words will be the winner. Click on the image shared above and then right click and save the bigger image to your computer. This beautiful game is decorated with cute daisies and I am sure your guests would love playing this game. If you have chosen a Bridal Shower themes that has to do with Lilac color then this lilac game printable will be a real good choice. You can also mix and match different game colors for your guests if you have not chosen any particular color as a theme. Pink is one of the favorite colors for Bridal Showers, that is why I have made the 'Name Wedding Relaed Items' game card in pink color as well. In order to print this image, click on the image that I have shared above and then right click and save the bigger printable version or print right away using the print command.